Last modified on Friday, August 24 2007. This question was created on August 24, 2007 by jdmiles. This question was last modified on August 24, 2007. This is an MRI diffusion weighted image. 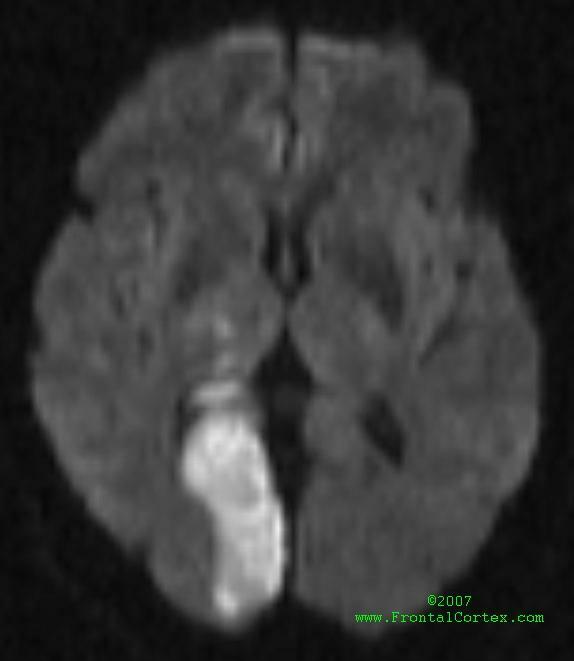 The bright area represents diffusion restriction, which can be seen in acute stroke. The area of diffusion restriction corresponds to the right posterior cerebral artery (PCA) territory. The posterior inferior cerebellar artery (PICA) does not supply the territory where this stroke occurred. This is an MRI diffusion weighted image. The bright area represents diffusion restriction, which can be seen in acute stroke. The area of diffusion restriction corresponds to the right posterior cerebral artery (PCA) territory. The stroke in this image is on the right, not the left. The superior cerebellar artery (SCA) does not supply the territory where this stroke occurred.